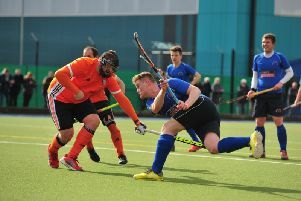 A stunning Charles Edmondson hat-trick scored in the space of just 90 seconds helped Harrogate Hockey Club Men’s 1sts to a laboured 5-1 victory over Alderley Edge. The goal rush towards the end of a frustrating and scrappy contest looked like it might not materialise as Will Rogers’ side struggled to pull away from their relegation-threatened visitors, having earlier fought back from a goal down . Harrogate, who sit third in the North Division One standings, seized a 2-1 lead thanks to strikes either side of half-time by Graeme Bevington and Harry Henderson. However, with time ticking by, leading scorer Edmondson netted three times in less than two minutes which enabled the Granby club to see out the rest of the match in comfort. The three points earned on Saturday, combined with Neston South Wirral’s 3-1 defeat at Gateshead, means Harrogate now have a five-point cushion in third position with a game in hand on their nearest rivals. That game in hand will be played on Sunday away at Lancaster & Morecambe (2.15pm start), following Saturday’s fixture at title-chasing University of Durham (3.15pm). “It’s a tough double-header weekend on the road, but a challenge that we’re fully up for,” said captain Rogers. “Durham will be a really good test of where we’re at as a team, and we’ll certainly have to perform better than we did against Alderley Edge where we showed good character to grind a result out despite not being at our best.